When you hit the brakes on your car, pressure is applied to slow you down and stop the vehicle. The same is true for your trailer. However, it is important for your tow vehicle brakes to communicate with your trailer brakes so they can work together to stop everything at once. This is where brake controllers come in. Most brake controllers can be adjusted to meet your needs. Some of these controller units automatically provide a proportional amount of pressure to the trailer brakes, giving you the right power to stop both your tow vehicle and your trailer. However, other controllers may require some manual adjustments before you drive to ensure the appropriate amount of pressure is applied. You don't want the trailer brakes to be too weak or too strong once they are engaged. One of the most important reasons to make sure you are using brake controllers when you tow is to protect your vehicle. If your vehicle's brakes were given the task of stopping both your vehicle and the extra weight behind it, it would create undue stress on your brakes. When the controller lends power to the trailer brakes, it reduces the stress on the tow vehicle and stops both parts of the vehicle safely. Before you even think of towing without a brake controller, it is important to realize why it is necessary, especially in certain situations. For instance, if you are towing your trailer through a mountainous region or along winding roadways, you need to be able to fully trust your braking power. If your brake controller isn't working properly in these situations, you could lose control more easily, causing a serious accident. 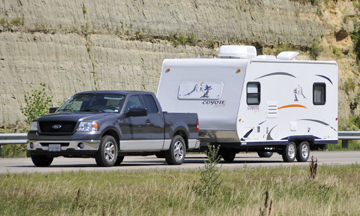 Brake controllers are one of the most important tools you need to safely tow your trailer. These controllers are designed to transfer power from your vehicle brakes to your trailer brakes, helping both vehicles stop quickly and effectively. If you are looking for brake controllers that meet your needs, contact us. We carry a selection of all types of controllers to help you stay safe on the road.